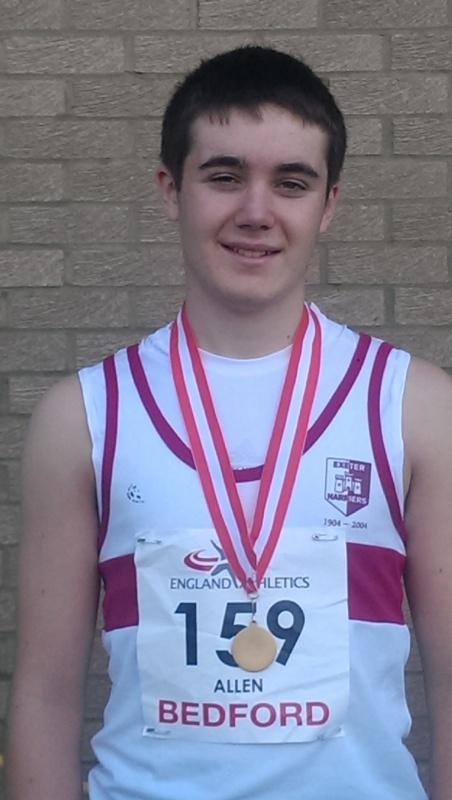 Sixteen year old Exeter Harrier Dominic Allen’s performance in the javelin at the England Athletics National Championships in Bedford has exceeded expectations with a new lifetime best and the bronze medal, adding 15cm to his previous best set last year. The realisation for Allen that he is now coming into form this season has pushed him to set his sights on the tough target of 60m with just a couple of competitions left in the 2014 outdoor season. Javelin success continued for Harriers with Jack Moncur competing in the same age group and finishing eighth with a best throw of 48.66. Sam Talbot took a different approach at the Championships, entering an event new to him. Following his success at the National Combined Events Championships three weeks ago Talbot entered the 400 hurdles at the individual event championships. A third place finish in his heat in a time of 58.07 was enough to earn him automatic qualification for the final, where he placed eighth in 58.37.